Les CD et DVD d'Alpha Lyra enregistrés lors de la soirée Space Fish le 21 août 2010, viennent de sortir chez MellowJet Records. 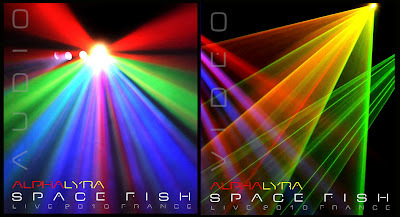 Live-recording from the Alpha Lyra "Space Fish"- concert on August 21st 2010 at the "INEXXA de Nantes", France. Alpha Lyra is one important actor of the French electronic music. He had offered a spectacular show with lasers and video creations. This evening "Space Fish" involved a cosmic and aquatic music, soaring and melodic "a la Schulze", which invites You to an inner journey, a sort of waking dream, the magic of electronic sound mastered. Sounds "cosmo-aquatic" and chorus of synths dreamers will be at the rendezvous !